Survey results show greatest challenge for consumers was finding affordable food. Taste, safety and price remained consumers’ most important values when purchasing food this month, according to Oklahoma State University’s April “Food Demand Survey” (FooDS). FooDS, a monthly online survey with a sample size of at least 1,000 individuals, tracks consumer preferences and sentiment on the safety, quality and price of food consumed at home and away from home, with a particular focus on meat demand. The April report shows that consumers’ food values remained similar to those in past months, with slight decreases in perceived values of price and nutrition and increases in perceived values of fairness and convenience. Similar to previous months, consumers reported that their main challenge was finding affordable foods that fit within their budget; the challenge experiencing the largest percentage increase was "finding foods my children will eat." In April, 6.21% of participants reported having food poisoning, a 10% decrease from the previous month. Genetically modified organisms (GMOs), Escherichia coli and salmonella remained the most visible issues in the news. The largest percentage increase in consumer awareness over the last month was for cloning. Among the most visible issues, the largest percentage decrease from March to April was for salmonella. Salmonella, E. coli and hormones were ranked as the top three concerns during April. The largest percentage increases in concern were for “pink slime” (lean, finely textured beef) and GMOs. The largest percentage decrease in concern was for bovine spongiform encephalopathy. The issue “cancer and meat consumption” was added to the lists, and its presence will continue to be followed in future months. Respondents were also asked to respond to a list of nine statements related to the perceived taste, affordablility and health of fruits and vegetables that are fresh, frozen or canned (Figure). 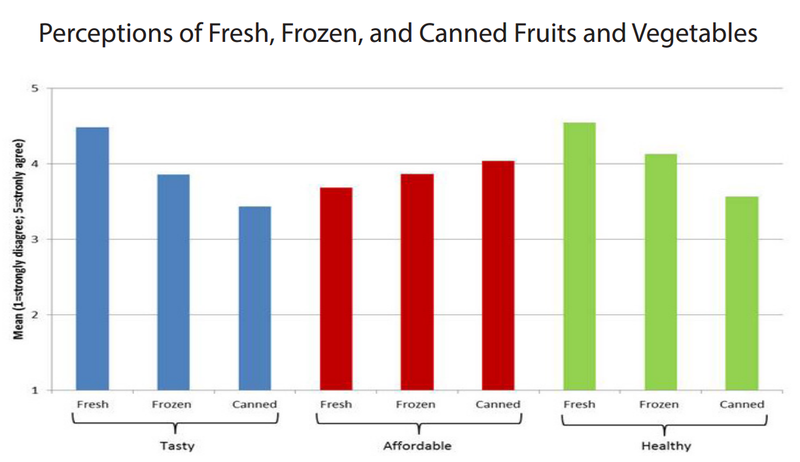 In terms of taste, fresh fruits and vegetables rated higher than frozen, which was rated higher than canned. All three had a mean score above 3.0, meaning respondents were more likely than not to agree that all three types of fruits and vegetables were tasty. In terms of affordability, the ranking was exactly reversed, with canned perceived as most affordable and fresh least affordable (although all three were far about the mean of 3.0, implying that most consumers thought all three types were affordable). Finally, perceived health lined up almost exactly with perceived taste, with fresh perceived as healthier than frozen, which was perceived as healthier than canned. The survey also asked consumers whether they believe the government’s role in regulating the U.S. food system should be more active, less active or the same. More than half of the participants (59%) said the government should become more active in regulating the U.S. food system, while less than 13% of participants believe the government should be less active.